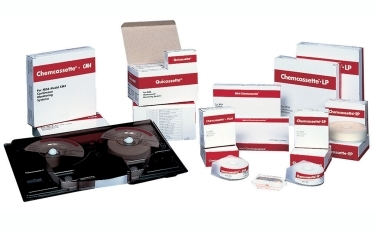 Chemcassette is the unique trademarked name by Sieger for a calibration free toxic gas detection method that uses an optical scanning system to detect the presence of a gas by the color change on a special chemically impregnated paper tape. Highly specific the Chemcassette technology reacts extremely fast the many hazardous gases to the presence of parts per billion (ppb). Currently over 200,000 points of gas detection are maintained by the Chemcassette sensing technology at any given time around the World as some of the most critical safety applications possible. Each Chemcassette is manufactured to traceable ISO 9000 manufacturing standards by a world class team of highly trained chemists. Each batch is calibrated with the ultra-pure gas at nationally accepted standards that are traceable. The end user does not have to provide calibration facilities themselves thereby saving cost and reducing the risks to their own staff. Efficient high volume manufacturing techniques means that there is always available Chemcassette in stock that can be shipped to anywhere across the World so that our customers are never left without adequate safety cover. Application support with our expert gas detection chemists is available by phone and e-mail and is supported with many years of technical application notes and helps to diagnose common support issues. Should there be any concern regarding the performance of an individual Chemcassette, a free of charge evaluation will be performed to trouble shoot the observed scenario using the "Customer Discrepancy Report" CDR an award winning quality management system. Completed by a customer every CRD is guaranteed a full response and the outcome is reported directly back to the end user to ensure a complete resolution process. Each Chemcassette is backed with a full warranty and we have over 20 years of experience owing to the quality control of its proven sensing technology.